Alternative methods were suggested to address these problems, such as the use of rice straws to attract earthworms. The farmers were also encouraged to plant simultaneously to limit the damage caused by stemborers. This recommendation was made in light of the farmers’ plan to adopt a community trap barrier system (CTBS). In Pasil, Kalinga, close to a hundred farmers from 5 villages (Galdang, Bagtayan, Masilay, Guina-ang, and Dangtales) came to participate in the technoclinic. Common problems that the farmers cited were zinc deficiency, stem borers, rat infestation, birds, rice bugs, golden apple snails, and diseases such as blast and brown spot. They also mentioned stunted growth and yellowing of rice plants. The farmers brought with them samples of disease- and insect-damaged rice plants. A suggestion made during the clinic as intervention in rodent management was community action, which includes synchronous planting and the use of CTBS. Farmers revealed that they had been using DDT or arsenic to control rat infestation. This practice has been found unsuitable in managing rats. The Pasil farmers' practice of allowing rice ratoon to proliferate during the fallow period has worsened the stemborer problem. Field sanitation was suggested to address it. It was also suggested that varieties tolerant to zinc deficiency be tested in the area to address zinc deficiency problems, since some of the fields cannot be drained due to the abundant and continuous supply of water. The conduct of the technoclinics was part of the provision of technical innovation services, a linkage that the Consortium for Unfavorable Rice Environments had built with the IFAD-funded Second Cordillera Highland Agricultural Resource Management Project (CHARMP2). Two teams were formed that facilitated and documented the technoclinics in Hungduan and Pasil, respectively: Renato Reaño (IRRI senior associate scientist), Evelyn Gergon (PhilRice plant pathologist), and Elenor de Leon (CURE communication specialist); and Joel Janiya (IRRI senior associate scientist), Isabelita Oña (IRRI associate scientist), Jessieca Catapang (IRRI videographer), and Heihke Panwitt (IRRI intern on plant pathology). 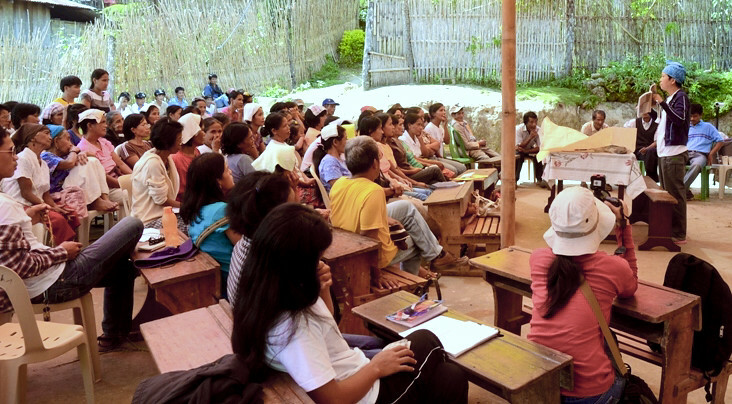 Farmers’ groups that have been identified for the technoclinics include the Lunas Tribal Women and Macalana Ammiyan Organization in Barlig, Mt. Province; RIC Golden Grains and RIC-Galdang in Pasil; and Bangbang Farmers’ Organization in Hungduan. The groups from Pasil and Barlig are composed of women farmers.